our local farmers' market opened on friday! hooray for fresh fruits and veggies at great prices! we stopped by the farmers' market on opening day, and we bought 5 huge zucchini, a bunch of green beans, and several peaches. fresh summer peaches . . . need i say more? 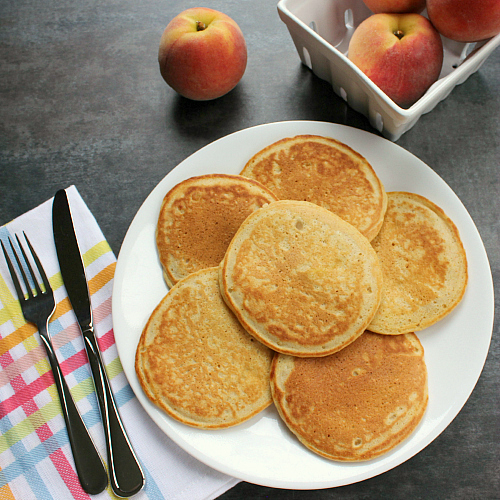 there are so many recipes that we can make with these peaches, but we put them to good use on saturday morning in pancakes! 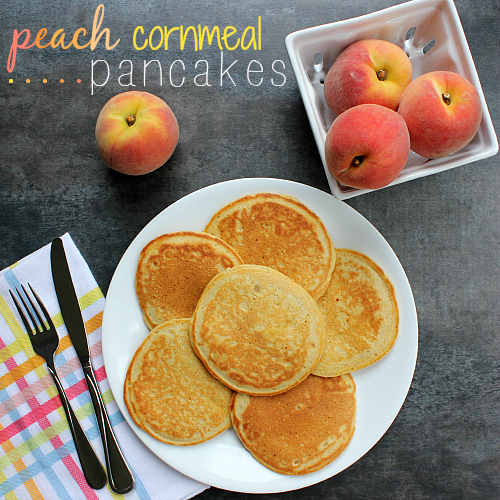 the fresh peaches got warm on the griddle, and they were absolutely delicious combined with the cornmeal. we poured warm maple syrup over the top of the pancakes and they were so good! combine the flour, cornmeal, sugar, baking powder, and baking soda in a large bowl. add in the milk and eggs and whisk until just combined. stir in the melted butter. heat a lightly buttered griddle or frying pan on medium heat. pour 3 tablespoons of batter onto the griddle for medium pancakes. 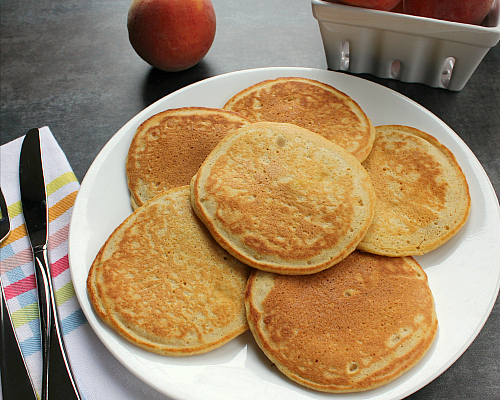 drop a few diced pieces of peaches in each pancakes. cook for 3 minutes, until small bubbles begin to form. flip the pancakes when they start to bubble, then cook for 2-3 minutes, until they are golden brown and cooked throughout. once cooked, transfer the pancakes to a baking sheet and place in a preheated 200 degree F oven to keep warm while you cook the remaining pancake batter. serve warm with warm maple syrup. I love the taste of fresh peaches. Not the hard rocks you get in the supermarket. I will try this recipe when I find some good peaches. I like the peach work in the title the way it is variegated just like the color of the peaches. These pancakes look really good. I agree with your mom about the artwork on the first photo. 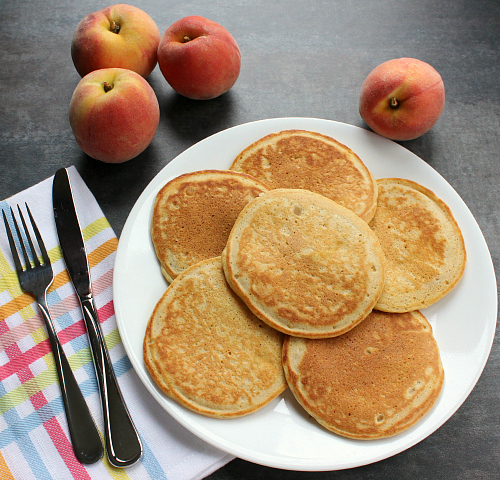 That photo is especially pretty; it makes the peaches and pancakes look really tempting.